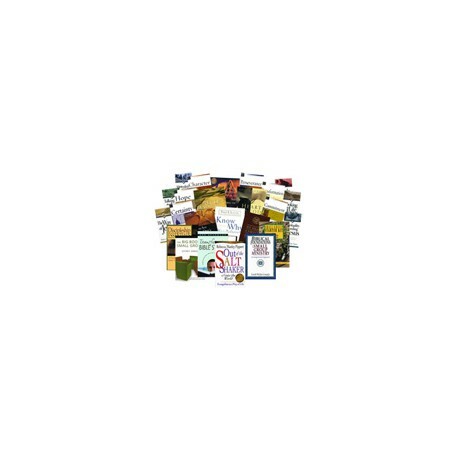 Put Some Power Into Your Bible Study or Small Group with this Collection of Contemporary Christian Faith Classics with Study Aids! Put Some Power Into Your Bible Study, or Small Group, with this Collection of Contemporary Christian Faith Classics with Study Aids! If you have been inspired by Christian authors such as Eugene H. Peterson, Bill Hybels, Rebecca Manley Pippert and Paul Little for their no-nonsense approach to living out faith principles – here's a collection of their “best-of” titles to add to your PC Study Bible library. The core titles, found in the Christian Basics Collection, are unmatched in their ability to get new believers started in the right direction, as well as remind mature Christians of timeless lessons in faith and its application. The studies are based on award-winning contemporary classics such as Rebecca Manley Pippert's Out of the Saltshaker and Into the World, and Paul Little's Know Why You Believe. Both of these titles were recently named by Christianity Today readers to a list of the top 50 books that have shaped evangelicals! The collection also includes a wealth of Bible study and small group content you can use to start a successful small group or improve the effectiveness of your current small group. This collection now includes 3 new titles from Eugene Peterson, Charles Hummel and Bill Hybels. See below for all 9 classic titles with accompanying study guides. Also updated for this collection is: Out of the Saltshaker and into the World – Plus Saltshaker Resource Kit 20th Anniversary Edition. And for keeping small groups alive and growing we have the Small Group Study Kit. We all long to live life at its best – to fuse freedom and spontaneity with purpose and meaning. Why then do we often find our lives so humdrum, so routine and lacking adventure? Or else so frantic and full of activity, but still devoid of fulfillment? How do we learn to risk, to trust, to pursue wholeness and excellence – to run with the horses in the jungle of life? Tucked away in the Hebrew Psalter, Peterson discovered "an old dog-eared songbook," the Songs of Ascents that were sung by pilgrims on their way up to worship in Jerusalem. In these songs (Psalms 120-134) Peterson finds encouragement for modern pilgrims as we learn to grow in worship, service, joy, work, happiness, humility, community and blessing. This 20th anniversary edition of A Long Obedience in the Same Direction features these Psalms in Peterson's widely acclaimed paraphrase, The Message. From the life and death of Samson to Peter's denial of Jesus, the Bible is filled with stories of people who wanted to serve God but frequently failed. And yet God still worked through these men and women for his purposes and glory. Through God's power, their points of weakness became their greatest strengths. In Never Beyond Hope, J. I. Packer offers his pastoral wisdom, exploring the stories of eight imperfect people portrayed in the Bible. Packer and Nystrom show you how their struggles and triumphs relate to your own experiences and highlights how God works despite your mistakes. Have you ever wished for a 30 hour day? Every week we leave a trail of unfinished tasks. Unanswered letters, unvisited friends and unread books haunt our waking moments. These studies are designed to help you put your life back in order by discovering what is really important. Find out what God's priorities are for you. Charles Hummel, former director of faculty ministries for InterVarsity Christian Fellowship, excels at providing biblically practical helps that have aided and grounded countless thousands for decades. He is also the author of TYRANNY OF THE URGENT, a booklet which can be used as a companion text to this Bible study guide. During the past fifty years, more than ten million readers have enjoyed Robert Boyd Munger's spiritually challenging meditation on Christian discipleship. Imagine what it would be like to have Jesus come to the home of our hearts. Munger's classic story takes you on a room-by-room journey considering what Christ desires for us. In the living room we prepare to meet Christ daily. In the dining room we examine together what appetites should and should not control us. We even explore the closets in our lives that Christ can help us clean out. David faced some desperate circumstances and some tough choices. So do you, day by day. In this book Rebecca Manley Pippert shows how you, like David, can choose the good, find hope and grow to be one who is known as having a heart for God. Listed in 2006 with Christianity Today'stop 50 books that have shaped evangelicals! Do science and Scripture conflict? A million people have already found clear and reasonable responses to the toughest intellectual challenges posed to Christian's today. This edition, revised and updated by Marie Little in consultation with experts in science and archaeology, provides twenty-first-century information and offers solid ground for those who are willing to search for truth. Including a study guide for individuals or groups. Most of us have trouble finding time to pray. There's just too many competing things – good and necessary things to do. And then the crises hit! Time for prayer seems an impossible luxury. As a pastor, Bill Hybels knows hundreds of people with schedules like this. Yet in his own life he has made the hard discovery that prayer doesn't happen on the run. He decided he was too busy not to pray. This accessible introduction to prayer has already helped many Christians develop a rich and regular prayer life in the midst of life's busyness. Now, in this revised and expanded 10th anniversary edition, he includes new insights from his years of ministry and his own spiritual journey. He shows how to slow down to pray, listen to God, respond to what is heard, practice the presence of God, and overcome prayer barriers. This practical book offers the resources you need for growing, ongoing experiences in prayer and includes the companion study guide Prayer: Too Busy Not to Pray. What are you like when no one's looking? That's where character comes in – it's being consistent even when it doesn't seem to matter. Courage, discipline, vision, endurance and love. These character qualities are quickly becoming endangered. All too often we hear of marriages falling apart, governments lying, businesses cheating and scandals rocking the church. But with God's guidance and strength, we can maintain character that lasts despite temptations and troubles. Listed in 2006 with Christianity Today's top 50 books that have shaped evangelicals! So begins the bestselling book on evangelism as a lifestyle. Through stories, biblical insight and plain common sense, Pippert helps us feel relaxed and enthusiastic about sharing our faith. This thoroughly revised and expanded edition of Out of the Saltshaker is now even more valuable, with new chapters on the natural stages of evangelism (cultivating, planting and reaping), new stories of God's work in people's lives and added material on meeting the challenges of the new competitors to Christian faith. Out of the Saltshaker is more than ever a rare book – one that is both fun and deep, light and life changing. For 20 years Out of the Saltshaker has been influencing believers to share their faith. During this time, Rebecca Manley Pippert has assembled an indispensable toolkit of resources that work hand-in-hand with the text. With this collection, you receive the entire Saltshaker Resource Kit – a $42 value—FREE! Gareth Icenogle thoroughly examines both Old and New Testaments for the basis of small group ministry. He considers the texts in new ways, providing heightened understanding of their implications for ministry in the context of small groups. Then he turns to the early church to study tradition and practice. In addition, he brings an integration of theological, sociological and educational principles to the biblical text. All through this add-on resource, practical applications of these principles offer guidance for setting up and running a biblically based small group ministry program. Those who are working or who hope to work with small groups will find this one-of-a-kind book invaluable. This workbook is a tool designed to help you follow the pattern Jesus drew for those growing in Him. Working through it will deepen your knowledge of essential Christian teaching and strengthen your faith. In this easy-to-use guide Jeff Arnold provides you with everything you need for the first meetings of a small group. Getting acquainted, setting expectations, studying Scripture – it's it's all here in a step-by-step format that will help you get a great start for your small group. Jeffrey Arnold knows the pressures of small group ministry, but he has also seen the power of small groups in many ministry settings. In this revised edition of The Big Book on Small Groups, he breaks down small groups so that you can see them from all angles. The first four chapters focus on the structure and benefits of a small group ministry. Further chapters explore the basics of Christian community – prayer, worship, Bible study, outreach and mission, as well as how to multiply groups. Resources for further reading, ideas for coaches and trainers, and curriculum to photocopy for small group sessions are also included. A constant companion throughout your small group ministry, The Big Book on Small Groups will give you the basics to get you going--and the support and nurture you need to make small groups effective as a strategy for outreach and discipleship. It's no secret… studying God's Word transforms lives. It knits together believers and revitalizes their relationships. Studying the Bible can also be dry, dull and seem to have little connection with your daily life. Fruitful Bible study is much more than a chain of platitudes in which people never say what they think or address the real questions they have about faith and life. Further, some approaches to Bible study require stacks of reference books, cross-referencing and three versions of the Bible. Other approaches ask you to fill in blanks like an elementary school child. Bob Grahmann presents a Bible study method that will bring Scripture to life in your personal study and in your group studies. He is a national and international Bible study teacher, expert at unfolding the long-appreciated method of inductive Bible study, which has been updated to meet the needs of today's generation. With both biblical expertise and cultural awareness he lays out the method clearly. With exercises to put the method into practice, this is a book that will benefit you individually as well as in your next group Bible study. Transforming Bible Study is all about making you and your small group grow in your 2 Timothy 2:15 ability to correctly handle God's Word of truth!